Martin and Ulrika came to Covenant in the summer of 2015 with their children (Amelie, Julie and a newborn Wilfred). 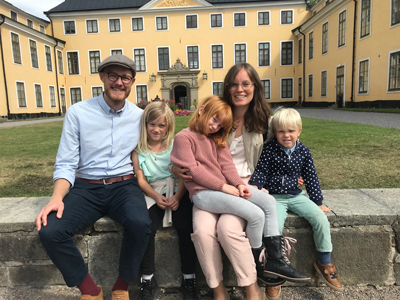 In the summer of 2017, they are returning to Stockholm where Martin will serve as a pastor of a inner city church and with an apologetics and outreach ministry called Apologia. Sweden is routinely listed as one of the two or three most secularized countries of the world. In the World Value Survey, Sweden is easy to spot in the top corner of "secular-rational" and "self-expression" values. At Apologia, Martin will get to work with a very gifted and experienced team that he knows well from many years of working together at a Bible College that was part of the Swedish branch of IFES (International Fellowship of Evangelical Sudents, known as InterVarsity in the U.S.). Martin's passion and call is to help Christians face and think through questions, doubts and objections to the faith, both in small and relational settings as well as by teaching, writing or podcasting. Ulrika will be working part time as a radiology technician and staying home with the children part time. Ulrika and Martin both have a desire to minister through hospitality, so Ulrika will also be involved in the relationship building aspects of the ministry.